Biophilia refers to the fact that as human beings, we have an instinctive bond with nature and our natural surroundings. In turn, Biophilic Design takes this bond and works to apply it to spaces where we live, shop, relax and work. Enter Biophilic Office Design! As the workplace has evolved, principles of biophilic design have begun to gain prominence as the resultant benefits such as reductions in staff stress levels and consequently absenteeism for example, have become difficult to ignore. But, what does biophilic office design entail and what are the benefits. 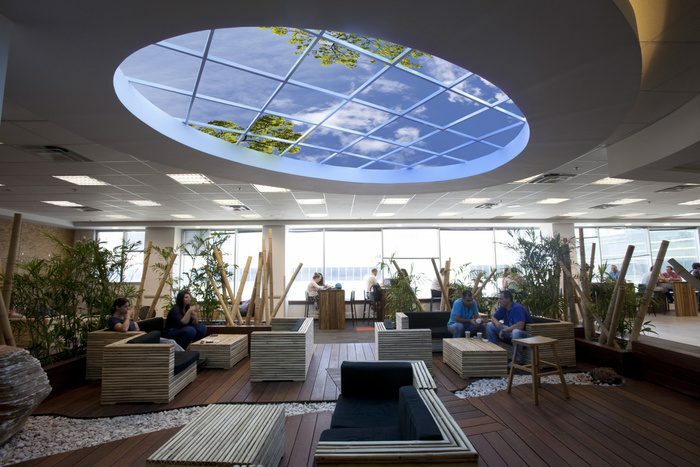 What is Biophilic Office Design? Biophilic office design refers to an increasing trend of bringing the outdoors indoors, or more accurately into the workplace. A common misconception is that biophilic design translates to adding lots of plant life and shrubbery, it is far more complex than that. 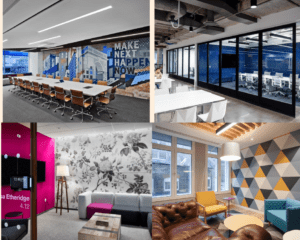 Many suggest that it is just a label that ties together some of the progressive office design trends and is in fact, about getting the standard things right and creating a workplace that truly works – somewhere that staff enjoy working. 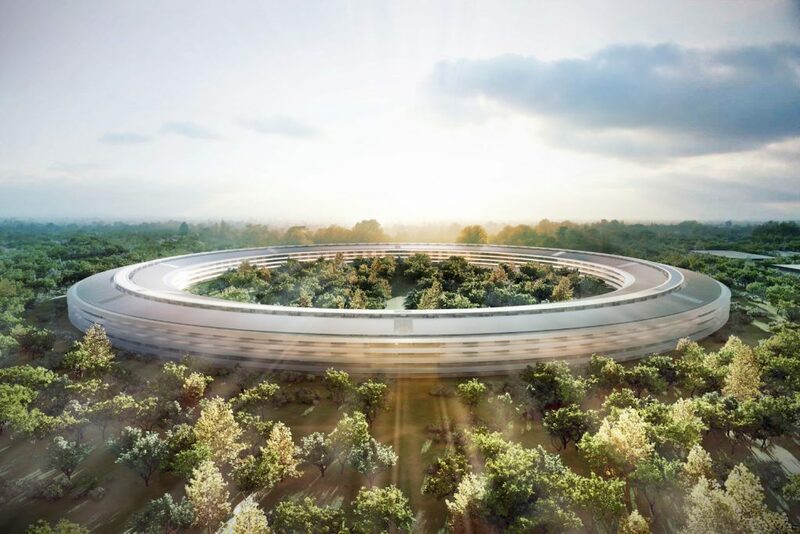 However, as mindfulness, workplace wellbeing and staff retention become increasingly important for many companies, and with companies like Apple creating a tree filled UFO-esque building in California and Amazon’s plans to construct futuristic greenhouse domes in Seattle, it seems like Biophilic Office Design has become ingrained and is here to stay. 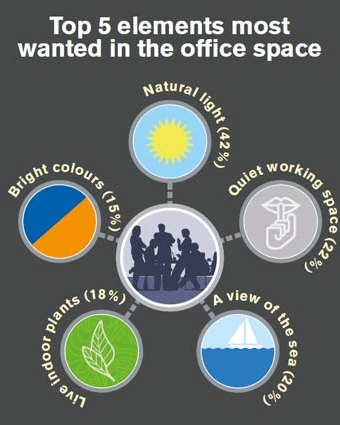 Access to natural light and views of the outside matters: According to a Human Spaces report, 30% of EMEA office workers don’t have access to natural light. 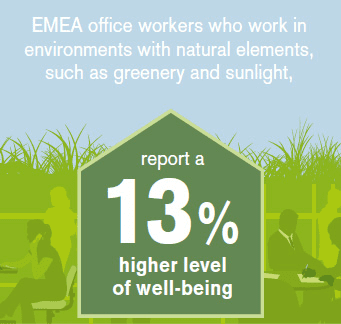 A shocking stat considering that natural light and views of the outdoors have a major impact on employee wellbeing, productivity and energy levels. Utilise available outside areas: If your company is fortunate enough to have an outdoor space (roof, balconies, garden etc..) use it properly. Add some comfortable seating and tables so staff can work outdoors when the weather permits as this access to natural light and fresh air has numerous benefits including increased productivity, creativity and wellbeing. Embrace colour: Colour can have an impact on staff wellbeing with numerous reports finding that dull colours can have a detrimental effect, while a study from France found that bright orange had a positive impact, while in Denmark, shades of blue worked best. Incorporate natural features like wood and stone: Including these natural features and textures can help to mimic the outdoors and really does follow the ‘bringing the outdoors indoors’ mantra. Include plantlife in the workplace: Perhaps one of the simplest and most obvious solutions, but including plantlife in the workplace can increase oxygen levels and subsequently improve concentration levels and decrease mental fatigue. Give staff space, and choice: Choice really is key. If staff want to concentrate, give them a quiet space to do so. If staff need to collaborate, give them a comfortable setting to do so, and make sure you provide enough space so it doesn’t feel overtly cramped or stuffy. This adoption and acceptance of biophilic office design is rooted in the fact that numerous studies have proven that by introducing elements of nature into the workplace, staff productivity, creativity and morale have all increased. In fact, a recent Human Space report highlighted the fact that workplaces who have introduced elements of nature have witnessed a decrease in the levels of mental fatigue among staff members and an increase in levels of workplace wellbeing. In the same report, they reference Maslow, of the hierarchy of needs fame, who studied office design and workplace aesthetics in the 1950’s and who found that the quality of office design had an impact on staff energy levels and morale. Evidently, this progression has been many years in the making. Indeed, the restorative qualities of nature can be replicated in the workplace in numerous ways – introducing plantlife, providing access to natural light where possible, including natural wood and stone finishes, embracing colour and crucially, providing staff with a choice of work settings and a comfortable work environment. While we have mentioned and referenced several benefits of biophilic office design, we thought that a list to summarise them would be useful. Improved productivity: A UK based study entitled ‘The Relative Benefits of Green versus Lean office Space’ found that workers with an exposed level of contact with nature were 15% more productive, compared to those with minimal contact. 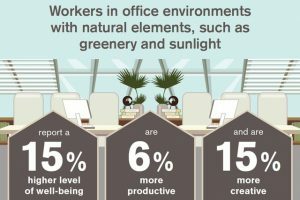 This can be attributed to a variety of factors including but not limited to better air quality, greater sense of wellbeing, improved concentration levels (see below) and/or a greater choice of work settings, including outdoor areas. Increased concentration levels: Plantlife in the workplace can vary from a selection of potted plants dotted throughout to elaborate living walls, but the end result is the same – they increase oxygen levels in the workplace which in turn, decreases mental fatigue and increases concentration levels, and some would argue, overall productivity. As nature continues to move indoors into the workplace, we have begun to witness more innovative design and also products entering the workplace to counter the fact that some workplaces simply cannot provide views and the optimum amount of natural light to all staff. We’ve also witnessed an increasing trend towards incorporating grass-like floors and also rough textures and finishes to the workplace. We also anticipate seeing the inclusion of living walls in more workplaces as companies are looking to embrace biophilic office design, while we have also seen sky ceilings that help create the illusion of the outdoors, although the jury remains out. Expect to hear more about biophilic office design over the coming months and years as the benefits and advantages of embracing nature in the workplace become even more difficult to ignore, and hence more commonplace.